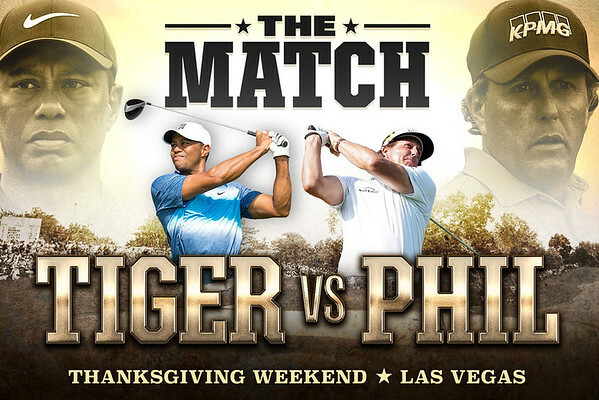 Contest and Live Update Thread: Tiger Woods vs Phil Mickelson in The Match! Thread: Contest and Live Update Thread: Tiger Woods vs Phil Mickelson in The Match! Tiger vs Phil is just about here and it only took a couple of decades for it to happen. The Match, coming to PPV, features the two biggest stars of the generation facing off in a head to head, winner take all match with $9 million on the line. Kicking off at 3pm EST and being played at Shadow Creek in Las Vegas, it is also the first live PPV event in golf. While that comes with a price tag of $20, it also means that we have four hours of golf (and lots of walking) with no commercial. Both players will be wearing mics for the entire round and the rumors of side wagers should make it rather interesting as well. We will be tuning in, will you? Seems pretty easy and straight forward here, pick the winner and then if you win, you have a chance at prize of a THP Prize Pack valued at over $500. It could be equipment, it could be anything really, but we know it will be 100% awesome. Entering is easy. Make a post in this thread with your prediction of who is going to win. That's it. Then join us in the thread for the entire round as we discuss the whole thing as we expect it to be a ton of fun. I'm not going to go out on a limb here when I say Tiger wins it. I'm Taking Tiger on this one. I'm thinking Tiger, and it doesn't get to 18. Tiger should win this easily enough. Will be a great match to watch. Tiger wins the match. Phil wins more side-bets. I can't go against Tiger so I'll take him for the win. I think lefty will keep it close and entertaining though. Gimme Tiger in a landslide. I think I already predicted a 5&3 margin so I'll go with that for the tie breaker, if there is one. M1 440 9.5° w/ HZRDUS Yellow 6.5 @ 44"
Tiger in a rout. This could be Stephen Ames worthy. Four hours? @JB must think they walk slow. First of all it ain't going to 18 holes. Second, how long can it really take for two of the best golfers in the world to play 18 holes of match play? I don't see 9&8, but I can't say I'd be surprised. Last edited by OGputtnfool; 11-21-2018 at 10:45 PM. I'm going to say Phil. I don't know... just a feeling. Tiger, and I don’t think it will be close.